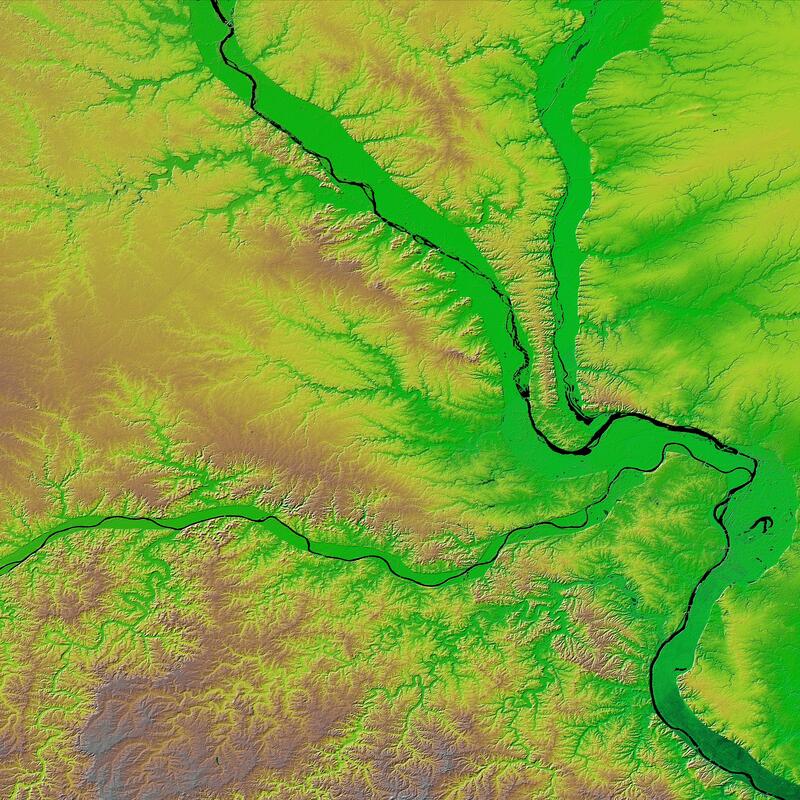 The confluence of the Mississippi, Missouri and Illinois rivers are shown in this view of the St. Louis area from the Shuttle Radar Topography Mission. The Mississippi flows from the upper left of the image and first meets the Illinois, flowing southward from the top right. 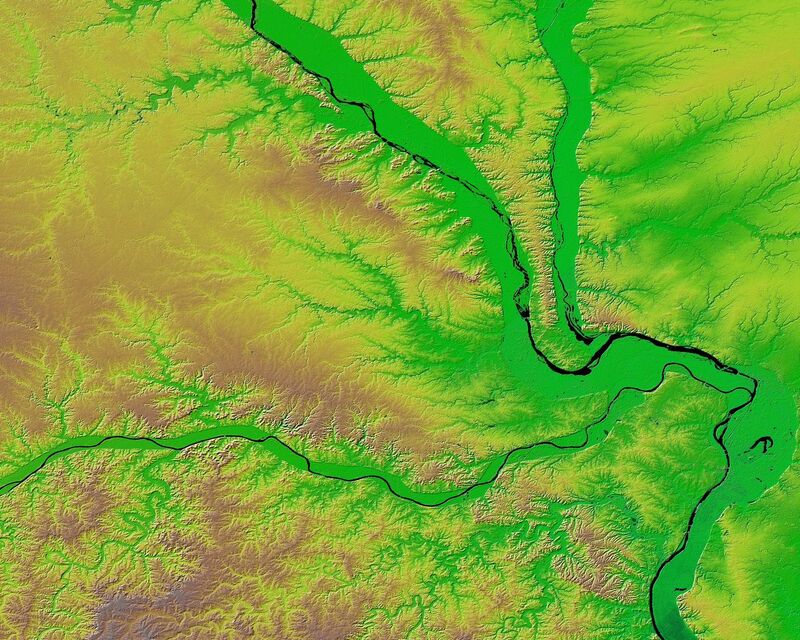 It then joins the Missouri, flowing from the west across the center of the picture. The rivers themselves appear black here, and one can clearly see the green-colored floodplains in which they are contained. These floodplains are at particular risk during times of flooding. The Mississippi forms the state boundary between Illinois (to the right) and Missouri (to the left), with the city of St. Louis located on the Mississippi just below the point where it meets the Missouri. This location at the hub of the major American waterways helped establish St. Louis' reputation as the "Gateway to the West." Two visualization methods were combined to produce this image: shading and color coding of topographic height. 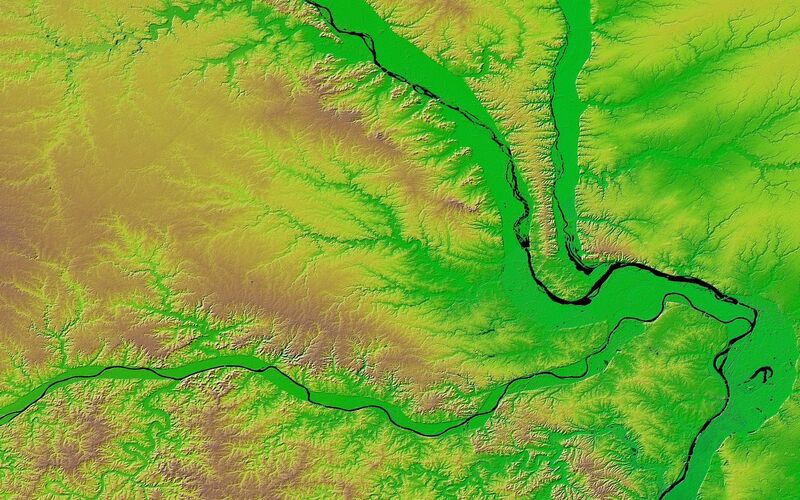 The shade image was derived by computing topographic slope in the northwest-southeast direction. North-facing slopes appear bright and south-facing slopes appear dark. 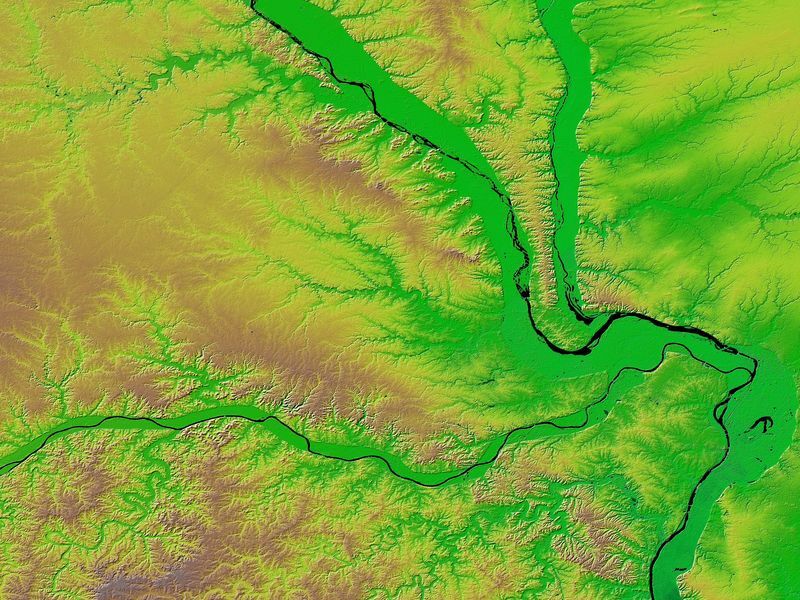 Color coding is directly related to topographic height, with blue and green at the lower elevations, rising through yellow and brown to white at the highest elevations. Elevation data used in this image was acquired by the Shuttle Radar Topography Mission (SRTM) aboard the Space Shuttle Endeavour, launched on Feb. 11, 2000. SRTM used the same radar instrument that comprised the Spaceborne Imaging Radar-C/X-Band Synthetic Aperture Radar (SIR-C/X-SAR) that flew twice on the Space Shuttle Endeavour in 1994. SRTM was designed to collect 3-D measurements of the Earth's surface. To collect the 3-D data, engineers added a 60-meter (approximately 200-foot) mast, installed additional C-band and X-band antennas, and improved tracking and navigation devices. The mission is a cooperative project between NASA, the National Imagery and Mapping Agency (NIMA) of the U.S. Department of Defense and the German and Italian space agencies. It is managed by NASA's Jet Propulsion Laboratory, Pasadena, Calif., for NASA's Earth Science Enterprise, Washington, D.C.